The ‘Journal of day-to-day management” [Archives of the Orientalists F. 152. Inv. 1а, unit 811] was kept by the outstanding scholar, specialist in the Iranian literature A. N. Boldyrev (1909-1993) from December 1943 till May 1945, when he was a researcher of IOS and representative of the Institute in Leningrad (08.05.1943 - 25.07.1945) in the time of blocade. The Journal and the onther document, published in appendices are very important for the study of A.N. 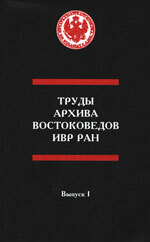 Boldirev’s biography, because in the years of work in the Academy of Science he became the real scholar and his name became known in all world. Key words: Researcher of Iraninan studies A. N. Boldirev, archival materials, personal documents, Leningrad blockade, the first publication. The article contains a publication of selected letters of a notable Russian semitologist Andrey Yakovlevich Borisov (1903-1942) to the Academician Pavel Konstantinovich Kokovtsoff (1861-1942), Borisov’s University teacher and a prominent scholar in the field of Semitic Studies. Both scholars died tragically during the Siege of Leningrad. The introduction contains biographical data and an outline of the fruitful and versatile research of both scholars, which was so vividly presented in the letters of Borisov. The first letter is probably the most interesting of all as it was written in Hebrew in a very high and elaborate style and it can be dated to 1924 when Borisov first came to Leningrad from Tartu and was aspiring to become a student of Kokovtsoff at the Leningrad University. He describes dramatically his learning and his amazing achievements in reading Hebrew literature. Other letters, which are dated to the end of 1930s, discuss various subjects in the general field of Semitic Studies, but mainly Judeo-Arabic literature in manuscripts of the Firkovich Collection in the Russian National Library and the Aramaic inscriptions from the Ancient Iran and Palmyra. The last letter published in the article is addressed to Ignatiy Yulianovich Krachkovskiy (1883-1951) and was written by Borisov in January 1942, a few days after the death of Kokovtsoff and a few months before his own untimely demise. This letter contains valuable information about both Kokovtsoff’s and Borisov’s families and early life and shows the origins of their specific interest in Semitic studies. The published article written in 1930 is the first large research by Yuri Vladimirovich Bunakov (1908-1942) perished during the Leningrad Blockade. Mostly Y.V. Bunakov studied history of Chinese writing and language, this work falls within his early research concerns. The article about “literary revolution” in China is interesting as an example of history of literature researches in 1930s, when scholars, brought up in classical Petersburg Oriental studies tradition, tried to develop their analysis with mainstreamed Marxian ideology which having been of interest at that time. The text is kept in Y.V. Bunakov’s personal fund in the Orientalists’ Archive of the Institute of Oriental Manuscripts of the Russian Academy of Sciences (F. 84. Inv. 1, unit 88). It is published for the first time. Keywords: Y.V. Bunakov, history of Chinese literature, literary revolution. The article of outstanding scholar in Caucasian studies, researcher of Central and Eastern Caucasian languages and languages of Transcaucasia A.N.Genko (1896-1941) is kept along with many others unpublished papers in the Archives of Orientalists of the Institute of Oriental Manuscripts, Russian Academy of Science [F. 74. Inv. 1, unit 117]. The subject this article is analysis of the project of Adygei spelling based on Russian alphabet, which was published in Nalchik in 1937. Key words: A.N. Genko, Caucasian Studies, Adygei spelling reform. Aleksandr Vasilievich Grebenschikov (1880-1941) was one of the leading Russian specialists on Manchu language and culture. Before the War, during his work in at the Institute of Oriental studies, he made a full Russian translation from the Manchu language edition of “The Imperially approved Code of Manchu shamanic rites”. The typewritten manuscript and its draft are kept at the Archives of the Orientalists (F. 75. Inv. 1, unit. 72, folder 1, ff. 16-28). An abstract from the first fascicle of his translation (ff. 16-28) concerning the rules of shamanic sacrifices at the Manchu court is published here. The article represents the publication of work of Pavel Petrovich Ivanov (1893-1942), an outstanding Russian historian of Central Asia. The article written by Ivanov in 1938 remains deposited in the Archives of the Orientalists at the Institute of Oriental Manuscripts, RAS (Fund 124, Inventory 1, unit 35) and represents the short review of political and economic history some of the Central Asian khanates, such as the Khanate of Bukhara, Khiva, Kokand and also illuminates some questions of the Kazakh’s history in the second half of the 18th century. It possibly was subsequently a basis for a writing of several chapters of his general work «Studies on the History of Central Asia» (16th to the mid of the 19th century) which was published in 1958 after the scientist’s death. Undoubtedly the article created in the late thirties in view of the publication of new researches and materials requires now some additions, but thanks to clearness of a statement, the deep historical analysis and selection of the facts, it still represents the great scientific interest. It is published for the first time. Key words: P.P.Ivanov, Central Asia, Kazakhstan, Studies on the History of Central Asia, The Khanate of Bukhara, The Khanate of Khiva, The Khanate of Kokand, Bukhara, Samarkand, Kazakhs. The published work had been written in 1934 as diploma paper of Vsevolod Nikolaevich Kazin (1907-1942), who died in blockade Leningrad. V.N. Kazin was a historian and linguist. He worked in the State Hermitage in 1934-1942, where prepared expositions devoted to culture and art of China and researched history of China under the Yuan dynasty and history of the Tangut State Xi-Xia. V.N. Kazin's thesis is kept in his personal fund in the Orientalists’ Archive of the Institute of Oriental Manuscripts, Russian Academy of Sciences (F. 133. Inv. 1, unit 1, ff. 23). It appears to be the first academic article in Russian where the authenticity and true scientific value of the encyclopedia “Yong-le da dian” had been shown in, and where its volumes stored in the Library of the Oriental Faculty of Petersburg - Leningrad State University in 1912-1958 are described. It is published for the first time. Keywords: V.N. Kazin, Chinese bibliography, «Yong-le da dian», Library of the Leningrad State University. Valery Evgenievitch Krasnodembsky (1907 - 1942) was a talented indologist, first specialist in the Marathi language in Soviet Union. Survived the first siege winter of 1941 - 1942, but acquiring an incurable disease, he died on his way to evacuation in spring of 1942. Article “Veddas” by Valery E. Krasnodembsky is a story of Veddas, indigenous tribe of Ceylon island. It was the first description of Vedda tribe in the Russian language. This work was conceived by V. E. Krasnodembsky in the mid of thirties as a part of two-volume edition of “Ethnographical studies of the people of foreign countries”. This intention was left unfulfilled; the article has never been published. Bearing handwritten marks of the author, its typescript is kept in the Archive of Orientalists, Institute of Oriental Manuscripts RAS (F. 92. Inv.1, unit 4). The article by V.P. Taranovich was written in 1939 after his visit to Kazan where he had studied the Oriental collections of the Tatar Republic Central Archives and the Library of the Kazan university. Among the books and manuscripts on Chinese and Mongolian studies, the author has listed previously unknown manuscripts which were donated by I. Bichurin to the Kazan Theological Аcademy. The characteristics of the material are followed by the history of Oriental studies in Kazan. Nowadays the typewritten text of the article is kept at the Archives of the Orientalists of the Institute of Oriental Manuscripts, RAS (F. 32, unit 4). The article was written in the late 1930s by an outstanding expert on Chinese bibliography Konstantin Konstantinovich Flug (1893-1942), who died in Leningrad blockade on January, 13, 1942. The text was conceived as a part of his doctoral thesis and is stored in K.K. Flug’s personal fund in the Orientalists’ Archives of the Institute of Oriental Manuscripts, Russian Academy of Science (F. 73, Inv. 1, unit 12). The paper introduces a review of contents and history of creation of well-known Chinese bibliography “ Zun zhai du shu zhi” 郡齋讀書志 (“Bibliographic Notes from the regional Governor’s Office”), which was compiled by scholar and collector of the Song dynasty Chao Gong-wu 晁公武 (1105-1180), and appears to be a substantial part of Flug’s works on bookpublishing in China. A part of article was included in the posthumous edition of the K.K.Flug’s monography prepared by Z.I.Gorbacheva “History of Chinese printing books under Song dynasty” (M. - L., 1959). It is published completely for the first time. Key words: K.K.Flug, Chinese bibliography, printing books, Song dynasty, Chao Gong-wu, “Zun zhai du shu zhi”. The article “The Khubilgans” by V.D.Yakimov hasn’t been published before. Its handwritten text is kept in the Archives of Orientalists of IOS RAS. (F. 83. Inv. 1, unit 19). V.D.Yakimov, a Mongolist and historian, researcher at the Institute of Oriental studies, was killed at the Leningrad front during the Great Patriotic War. The article was written at the end of 1930th and corresponds to one of the chapters from his unpublished book “The Origin and Development of Buddhist Church in Mongolia”. In the article the author describes what the Khubilgans were and how widespread this phenomenon was in Mongolia. Key words: Archive, Manuscript, V.D.Yakimov, Buddhist church, Mongolia, khubilgan. These materials are believed to have been prepared for the special issue of the Institute wall newspaper dedicated to the 30th anniversary of victory. They were rewritten and edited by D.E. Bertels who was the Institute’s biographer. The notes included into the publication deal with the memoirs of World War II participants - later members of the Institute for Oriental Studies in Leningrad and some persons who returned to Leningrad from Tashkent where the Institute stayed during the war. Key words: World War II, The Institute for Oriental Studies Leningrad Branch, Archives.